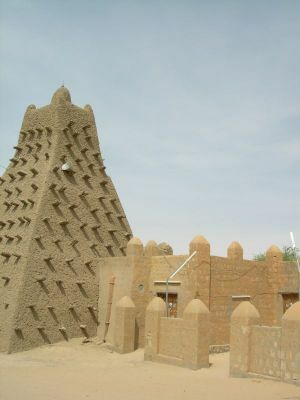 The July-August issue of Natural History magazine features a five-page article on Timbuktu, an excerpt adapted from the authors' forthcoming book, Timbuktu: The Sahara's Fabled City of Gold (Walker & Co., 2007, due out in August). In addition the magazine's Online Extras: Web Links section features links to Unesco's and Worldheritagesite.org's web entries for Timbuktu; the Timbuktu Manuscript Project site; the web site of Shindouk, chief of the Tuareg community of Ouladnagim; and an extensive selection (pdf) of Ray Kea's Archaeology of West African Empires. Brooke Allen and Peter Ogego, Kenyan ambassador to the United States, at yesterday’s ceremony returning nine statues. 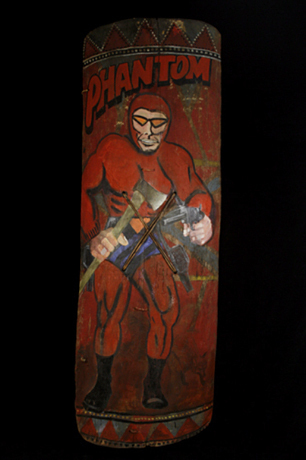 For some two decades the nine carved statues were displayed in the Park Avenue apartment of the producer Lewis M. Allen and the screenwriter Jay Presson Allen. Tall and slender with rounded heads, the postlike figures seemed more like exotic conversation pieces than relics with a religious purpose, the Allens’ daughter, the writer Brooke Allen, recalls. Yesterday all nine wooden statues were formally handed over to the Kenyan government in a ceremony at the United Nations. Eventually they will go on display at the Nairobi Museum. Ranging from four to six feet tall, the objects, known as vigango, were looted in recent decades from the burial sites of the rural Mijikenda people on the Kenyan coast. Such figures are carved and posted at the graves of high-ranking members of a secret society called the Gohu, and the Mijikenda believe that bad luck will ensue if they are removed. 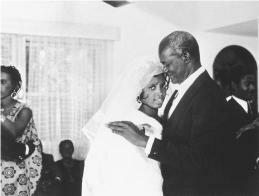 Alerted to their significance recently, Ms. Allen, the couple’s heir, decided that they should go back to Kenya. Asked whether her parents had been aware of their significance, she said, “I don’t think they knew.” Nor could she recall how they purchased the statues, although she estimated that it was in the early 1980s and said she doubted that her parents paid much for them. Valued at $10,000 each today on the open market, vigango have often been looted from graveyards in Kenya, making their way into collections in the United States and Europe. 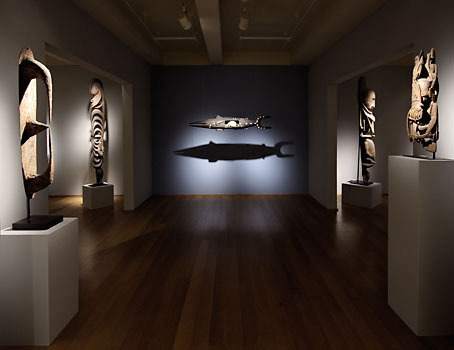 Experts estimate that at least 400 are held in the collections of individuals and museums, including at least 19 museums in the United States alone. In case you missed it the Sunday New York Times magazine's cover story, "The Possessed", chronicles the ongoing dispute between Yale University and the government of Peru over the disposition of archaeological materials excavated by Hiram Bingham in the early twentieth century. 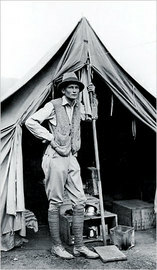 Author Arthur Lubow profiles the many colorful parties to the dispute: Hiram Bingham III, the "imposingly tall and strong-minded" adventurer whose original promises to the Peruvian government are still not entirely clear; Richard Burger, professor of anthropology at Yale University, and his wife Lucy Salazar, ambassadors and negotiators for the university; Eliane Karp-Toledo, European-born wife of former Peruvian president Alejandro Toledo, "a slim woman with long, wavy reddish blond hair and a fondness for fashionable versions of Andean woolens and ethnic jewelry"; Luis Lumbreras, "charismatic Marxist ... specialist on pre-Inca Peruvian cultures" with an unfortunate blot on his copy book; and Terry Garcia, executive vice-president of the National Geographic Society, caught between two unyielding institutions while trying to protect his own against potentially damaging blow-back. All in all the stuff of a thoroughly engrossing telenovela. African arts is available online via WATSONLINE. The Summer 2007 issue of African Arts includes a 'first word' column on a promising new online scholarly research resource for Africa. This resource first came to the library's attention in early April, when Aluka announced the roll out of its cultural heritage site component. Aluka is "an international, collaborative initiative [to build] an online digital library of scholarly resources from and about Africa," according to the project's History and Mission page. Aluka seeks to attract high-quality scholarly content about Africa from institutions and individuals across the globe ... By aggregating these materials online, the Aluka collections link materials that are widely dispersed and difficult to access, opening up new opportunities for research, teaching, and broader public discussion. One of Aluka’s primary objectives is to provide African scholars and students with access to scholarly materials originally from Africa, but now out of their reach. Aluka is a project of Ithaka, a not-for-profit organization formed “to accelerate the adoption of productive and efficient uses of information technology for the benefit of the worldwide scholarly community.” Aluka is affiliated with both JSTOR and ARTstor. Work began on Aluka in early 2003. Aluka's target audience is primarily the "higher education and research community," with most resources selected and pitched to undergraduate students and their instructors. Some resources may have particular application to specialized researchers. Access to Aluka is open to "any educational, research, cultural, or other not-for-profit organization that joins Aluka by signing a participation agreement." Outside of Africa a fee is involved. During the 'Preview Period' any institution with access to JSTOR (including this one) has free access to Aluka content. (There is no indication how long the Preview period will last.) The Preview period will end December 31, 2007. In addition to the content areas themselves, additional pages highlight Featured Collections (for instance, the Melville J. Herskovits Library of African Studies) and a running list of Latest Additions. There is also an FAQ Page. Struggles for Freedom in Southern Africa "consists of more than 180,000 pages of documents and images, including periodicals, nationalist publications, records of colonial government commissions, local newspaper reports, personal papers, correspondence, UN documents, out-of-print and other particularly relevant books, oral testimonies, life histories, and speeches" reflecting the history of the struggle itself: "colonial rule, dispersion of exiles, international intervention, and worldwide networks that supported successive generations of resistance within the region." African Plants "comprises scientific data contributed by the African Plants Initiative (API) ... API's long-term goal is to build a comprehensive online research tool aggregating and linking presently scattered scholarly resources about African plants, thereby dramatically improving access for students, scholars, and scientists around the globe." 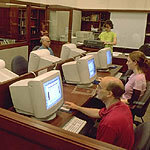 It is this last collection which has the potential to provide the most valuable information for our research community. The collection is organized around what Aluka calls a "cultural landscape." As of April 2007 five cultural landscapes had been identified: Kilwa Kisiwani—a medieval city on an off-shore island in Tanzania; Lalibela, Ethiopia—capital of the Zagwe Dynasty and famous for its rock-hewn churches; The Asante Temples at Besease and Patakro, Ghana; Djenné and Timbuktu, Mali, celebrated for mosques in Sudanic style; and a preliminary collection of digitized photographs of African Rock Art. Future landscapes will include the stone ruins of Great Zimbabwe; the stelae field at Axum, Ethiopia; Elmina, Ghana; Lamu archipelago located on Kenya's northern coast; and five rock art shelters and caves in South Africa’s Cederberg Mountains. Each of these cultural landscape areas "includes a vast range of visual and textual materials ... [including] high-resolution, metrically accurate digital photographs, two-dimensional site plans, three-dimensional models of structures, towns, and landscapes, spatial/geographic information systems (GIS), digital video and panoramas of the sites, and in the future, computer visualizations with walk-through capabilities. 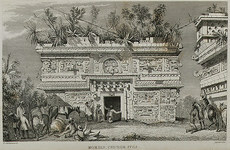 "Related contextual materials ... include, for example, a selection of digitized scholarly articles, monographs, and travelogues from the National Museum of African Art, Smithsonian Institution Libraries, and the Melville J. Herskovits Library of African Studies at Northwestern University; some antiquarian maps of Africa from the Afriterra Free Cartographic Library; selections of narratives, drawings, and documents of and by the |xam and !kun people of southern Africa as collected in the 19th century by Lucy Lloyd and Wilhelm Bleek; and a unique collection of field notes and images from excavations at Kilwa Kisiwani carried out during the 1960s and early 1970s by Neville Chittick, the first Director of the British Institute in Eastern Africa." 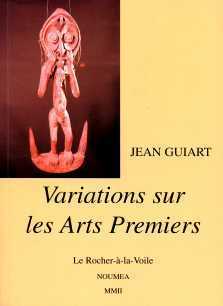 Former AAOA fellow Nicole Peduzzi reviews Jean Guiart's Variations sur les arts premiers in the March 2007 issue of The Journal of the Polynesian Society (p. 75-76). A copy is available in the Goldwater Library (this journal is not online). 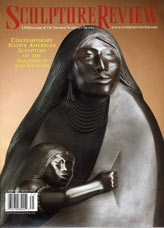 Sculpture Review is available online via WATSONLINE.